In classical economic terms, inflation is defined as too much money chasing too few goods. A consistent increase in the prices of goods and services over an extended period would constitute inflation. According to monetary economists like Milton Friedman, this is primarily caused by factors which are based on money supply. The traditional approach to combating inflation has therefore revolved around monetary policy. In India too, the Government decided to bring the provisions of the amended RBI Act regarding constitution of a Monetary Policy Committee (MPC) into force on 27 June, 2016 so that the statutory basis of MPC is made effective. Under this framework, the RBI will be responsible for containing inflation targets at 4% (with a standard deviation of 2%) in the medium term. Nearly three years after the coming into being of a statutory MPC, it is time to ask whether the obsession with inflation targeting has hurt our economy, particularly the farm sector. The recent Assembly election results in Madhya Pradesh, Rajasthan and Chattisgarh were partly impacted by the farm distress which arose mainly because farmers were not getting remunerative prices for their produce. The most popular index of inflation in our country is the Consumer Price Index (CPI). The CPI inflation in December 2018 slumped to an 18-month low of 2.19%. The weightage of food and beverages in CPI is 54% in rural areas, 36% in urban areas and the combined weightage is near 46% in the index. The Ministry of Statistics and Programme Implementation which puts out these figures said that food inflation remained in the negative zone at -2.51% in December compared to -2.61% in November. The main reason why inflation as measured by the CPI has remained low is the continuing decline in the prices of food and beverages. This category includes cereals like rice and wheat, pulses, milk and milk products, sugar, fruits and vegetables. For almost all these items, the retail prices have either been steady or lower than they were almost three to four years ago. Housewives who had bought Tur dal at almost Rs 200 per kg in 2015 are able to buy it at near about Rs 100, just half the price four years ago. For Moong dal, which cost about Rs 110 in 2015, the price now is only Rs 75. Almost all farm produce including vegetables are now selling either lower or at the same price they commanded about four years ago. In December, the Times of India reported that two farmers from Satana taluka near Nashik dumped 30 quintals of onions on the road as they were offered a price of Rs 1.50 per kg of onion whereas the cost of cultivation itself was Rs. 9. Similarly, there have been reports of dairy farmers emptying milk on the streets as the price realization was so low that it made their vocation unviable. Most dairy cooperatives in India are procuring milk at about Rs. 20/22 per litre which is ironically near about the cost of a litre of bottled drinking water. Ideally, these items of mass consumption should have seen moderate increase in prices so that the producers (farmers) would have got economic returns on their activity and in turn, their surplus would go towards creating demand for other goods and services which would induce growth in the economy. It has to be admitted that despite the problems faced by the farm sector, the Indian economy has continued to remain the fastest growing in the world with the GDP increasing at over 7% year on year. The growth has been driven primarily by the services sector and of late, by Government expenditure. There are certain sectors which are labour intensive like construction which have seen a slowdown despite the overall growth. Real estate developers have continued to accumulate inventory of unsold apartments. At the end of September 2018, India’s top 28 listed realty companies had unsold apartments aggregating to Rs 1,13,000 crores. This is equivalent to 32 months of sales in the sector. Some analysts are of the view that it may take three years for realty companies to clear their unsold inventory. Of course, it should be noted that the Union Government’s affordable housing scheme called the Pradhan Mantri Awas Yojana has found takers in the market with the Government stating that over 1 crore houses have been built in the rural areas in the last four years under the scheme. But when one looks at the macro picture, the undue importance given to inflation control seems to have depressed demand and negated the prospect of positive returns for investors, including in the farm sector. This is not to suggest that higher prices should be induced in the markets to benefit producers at the cost of the consumer. But if the producers do not get real positive returns (nominal returns after adjusting for inflation) the factors of production are likely to be used inefficiently and the economy will falter. The dilemma for policy makers is to see to it that inflation remains moderate, almost Goldilocks-like, neither too high nor too low, neither too hot nor too cold, so that the growth momentum is maintained and all participants in the economy receive a fair deal. Famous British economist John Maynard Keynes believed that some inflation was necessary to prevent the ‘Paradox of Thrift’. If consumer prices are allowed to fall consistently, consumers learn to hold off their purchases to wait for a better deal. The net effect of this is to reduce aggregate demand, leading to less production and an adverse fallout on the growth momentum. At the present juncture, what our country perhaps needs is a little bit of higher inflation, especially in food prices (the increase being moderated with appropriate State intervention) so that producers get a decent return. 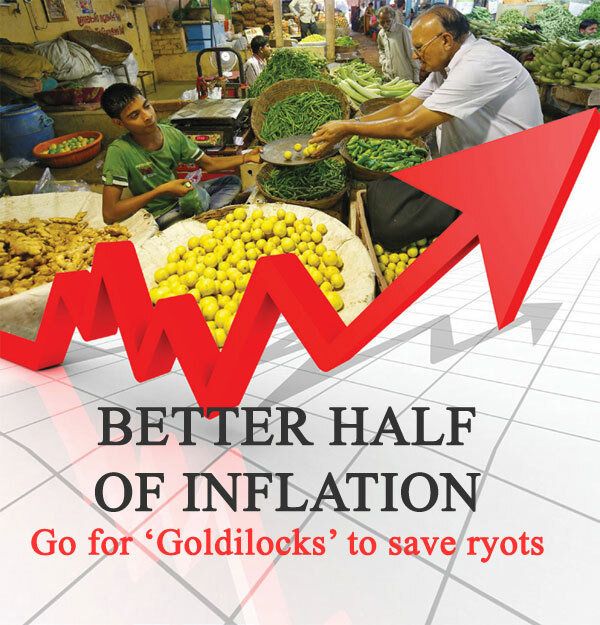 This can be achieved through a Keynesian response, with a slightly looser monetary policy with reduction in interest rates by the RBI, further injection of liquidity in the system or through fiscal stimuli including income support cash transfers for farmers and the poor, so that aggregate demand is boosted. The farm price revival will have a beneficial effect on the rural economy at large which will have a spinoff impact on demand for automobiles, consumer goods and services, spurring jobs-led economic growth.